She shows it to her students’ parents, includes it with a letter chart in her kindergarten homework envelope, and refers to it during her 1st-quarter progress report. For more information on developing the tripod grasp, see Hold the Pencil and the Hold the Pencil Pamphlet. Self-Assessment of handwriting work. montessoritidbits.com See montessoritidbits.com for Leann’s tips onImproving Handwriting with Draw Write Now. The Warm-up—review notes from the prior day and work on letters needing help. Drawing and Writing—30 minutes of drawing and writing. Self-Assessment—look over the writing and noting the best work and the things that can be improved. In the classroom, the warm-up and assessment process is just as important. Handwriting improves when the teacher checks over the students’ drawings and writing, noting issues and adjusting the next day’s lesson. My mom, Marie Hablitzel, had over 30 students in her classes, making it difficult for one-on-one time for self-assessments. The assessments were made, though—she carefully reviewed each of her students’ drawing and writing papers after class and adjusted the next day’s lesson or found time to work with students needing individual attention. Assessment is a huge part of improving handwriting. Newsletter | August 2012 . Is nonfiction a significant part of your child’s reading material? The Common Core State Standards recommends that fifty percent of children’s reading text be fiction and fifty percent informational material, like science, social studies and history. Look for books that explain or are factual. Use written text to learn about the world. It’s one thing to write an imaginative story, it’s another thing to accurately describe and report. As with reading, the Common Core suggests that nonfiction and fiction writing skills be balanced. While drawing a polar bear, discuss the Arctic region and guide the children in drawing an appropriate Arctic background. The things included in their background drawing may serve as a prompt as they write about the bear’s environment. Show that you enjoy reading nonfiction. 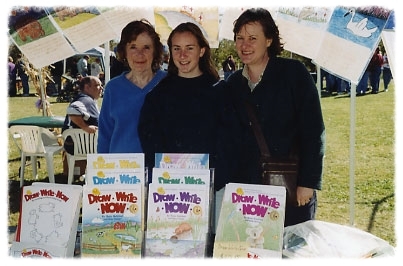 Marie Hablitzel, the creator of the Draw Write Now lessons, kept a children’s encyclopedia close by while giving a lesson. When the opportunity arose, she read a paragraph or two aloud from the encyclopedia. Her interest in reading sparked the children’s interest and her thought-provoking questions nurtured their curiosity. Drawing instruction improves vocabulary, because basic words are demonstrated during a drawing lesson. While teaching, simply describe a line or shape and describe their relationships to each other. You may not even realize that you are modeling these words: over, under, above, below, left, right, diagonal, curved, straight, horizontal, vertical, near, around, between, center, half, quarter, smaller, larger, short, long, zig-zag, choppy, smooth. Read multiple books on the same topic. A variety of sources provides a broader understanding of the topic. Nonfiction books on the Arctic:One Small Square: Arctic Tundra by Donald Silver, Houses of Snow, Skin and Bones by Bonnie Shemie, Here is the Arctic Winter by M. Dunphy, Sunshine Makes the Seasons by Franklyn Bradley. Thick fur keeps them warm. They swim in the icy ocean. Why do Arctic foxes follow polar bears? Polar bears hunt seals, but eat only the fat of the seal. Arctic foxes follow the bears and feast on the leftover seal meat. See Alaska’s Three Bears, by Shelley Gill. Common Core State Standards provide a clear understanding of what students are expected to learn, so teachers and parents know what they need to do to help them. Individual states are adopting the standards, see New York.